I actually finished a little project! I have been so busy with the kiddos being home for a month, subbing at the high school cafeteria and working at the apartments. It's really hard to carve out time for projects. But, now the kiddos are back in college until spring break and I think I'll be done with the other "stuff" soon. The gallery wall in my pool room is still my main priority to finish. Even though, I'm dying to start work in my family room and kitchen. I want this wall to be different and interesting. I don't want to just throw up a bunch of pictures. So, I'm working on a plan. It's definitely not going to happen overnight. Here is the first project for the wall. I've seen so many of these on Pinterest. I think they are so adorable! 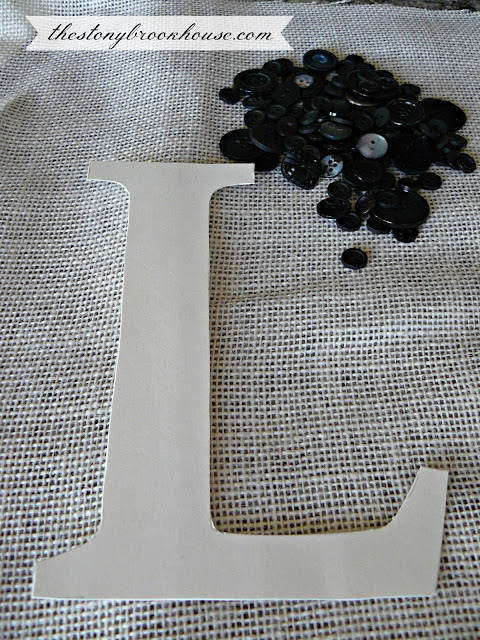 so I thought it would be cute to make an "L" for the wall. so I went and purchased a yard of it for about $1. I wanted a somewhat interesting looking "L". The Times Roman font works for me. Printing it out, I realized I didn't make it large enough, so I just free handed it a bit larger and cut the letter in half and added paper to lengthen it. Then I traced it onto poster board, in case I want to use the stencil again. 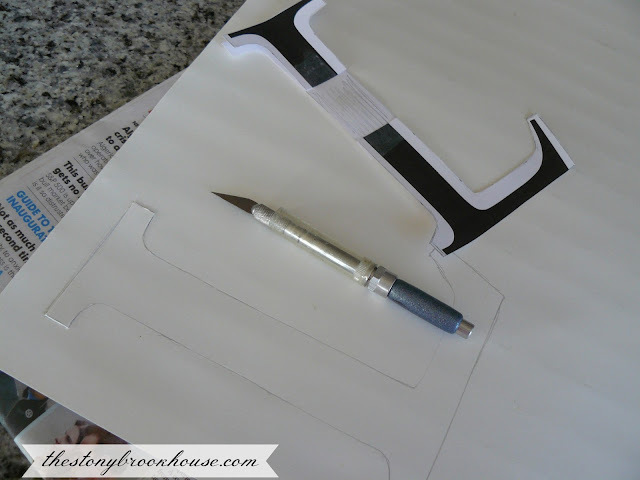 It was easy to cut out with the exacto knife. 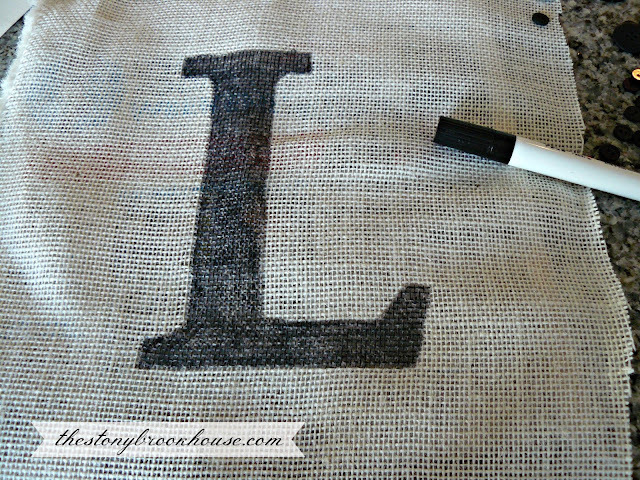 I centered it on the burlap and traced it. A bunch of cool buttons, I just happen to have them on hand. Hubby asked me where I got them. I really have no idea... maybe my mom at some time? I used a permanent marker to fill in the initial. I wanted it to appear completely filled in. Plugged in my glue gun and got to work. I started with little buttons outlining the entire letter. Then I stacked them with more interesting buttons. That's really all there was to it. I'm really happy with the way it came out! At least the monogram, I'm not thrilled with the frame. But I wanted to finish this. I have WAY better plans for the frame. Remember I said I wanted the wall to be different and interesting. Well, that frame is common and boring. Such a great idea! Love it, Lori! Your monogram looks great, Lori! Thank you for sharing! Hi Jules! Thanks so much! Love this! I might have to try this out - I've got a few cool frames that need something in them! Thanks, Eliesa! It was soooo easy and fun! Happy One Year Bloggy Anniversary!! Yay!